Rep. Butler and union workers celebrate contract approval at the Capitol. By an overwhelming vote, the legislature has voted to approve a contract that raises wages, increases holiday pay and provides workers' compensation for thousands of private sector, personal-care assistants who are directly employed by their elderly and disabled clients, but paid through state and federal programs. 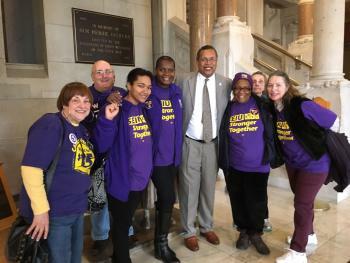 The House voted 127 to 16 for final passage of the contract negotiated on behalf of the workers by the New England Health Care Employees Union, District 1199, with a PCA Workforce Council created under legislation passed in 2012 with the support of Gov. Dannel P. Malloy. The Senate vote was 32-0. For more on this important story, read this CT Mirror news article.